Breakfast Lasagna Makes It Easy! When you think about making a special breakfast for your family or invited guests, do your first thoughts go to eggs, bacon and pancakes? Have you ever thought about lasagna? We didn’t think so! For holidays and special occasions such as the upcoming Easter holiday, you might want to break the habit of being a short order cook and try this delicious Breakfast Lasagna. 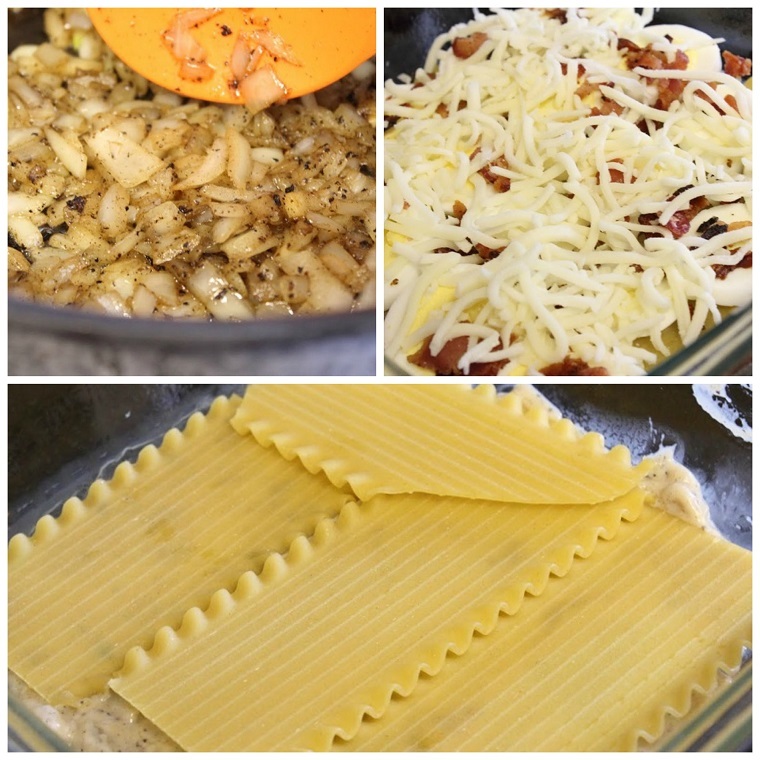 This unique dish is packed with great flavors and ingredients that will keep your family or guest’s appetites satisfied for a good portion of the day. It can also be made the night before and finished in the oven in the morning saving you precious time to enjoy your morning. Gather up your ingredients the day before. You can boil your eggs and fry your bacon 24 hours in advance to save yourself some time. 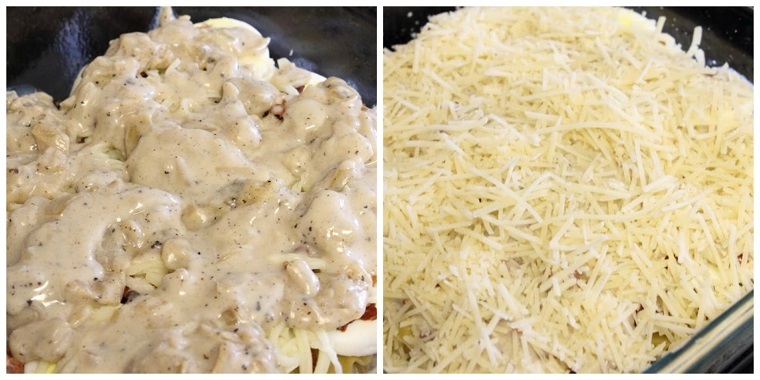 Prepare your white sauce, pour into the lasagna pan and start layering your ingredients according to the directions. Finish up with pouring the rest of the white sauce on top of the mozzarella cheese and sprinkling the top with Parmesan cheese. Pop in the oven and bake at 350 for 30-35 minutes or until brown and bubbly on top and garnish with parsley if desired. Time to pour a cup of coffee and sit back and enjoy! Boy you said it – let’s “break the habit of being the short order cook!” Here, here! 🙂 It looks so cheesy and delicious. My family would love this! I never would have thought to make a breakfast lasagna! I’m sure my kids would devour this! Say what?!? This is the most amazing look dish and I have never seen anything like it. This is going in my bookmarks immediately!! This would like maybe 5 min in my house. My eye’s bugged out! I would love this! It is like you are breaking some rules, but who says what s for breakfast, and what is right for dinner! I want this now! Thank goodness I am off of work tomorrow because I WILL be making this for breakfast. This looks beyond delicious. Oh, that looks DELICIOUS. I know what I’m making tomorrow! Whoaaaaa this sounds so good! I’ve never heard of a breakfast lasagna but let’s be honest: anything with bacon in it HAS to be good! Now that looks really good. I am going to make this for our Easter brunch. Ok, this would be a huge hit in my house. I am putting this on our menu for next weekend. Oh this looks like heaven in the morning! Pinning for later but it won’t be too long before I revisit. Yum! I love breakfast! I”ll have to try this, it looks really filling. I NEVER thought about doing a breakfast lasagna!! Great idea!! Looks really good. I never thought of adding the eggs. I guess some extra protein never hurt. This is great! I’d love to serve my family something like this. I’m always searching for something new to serve them. They get tired of the same old same old. Thanks for the recipe and great photos too, they will really come in handy. Yummy this would be awesome for those nights when we have breakfast for dinner. Thank You. Oooh. That looks really hearty. I like breakfast dishes that fill me up and this certainly looks like it would! 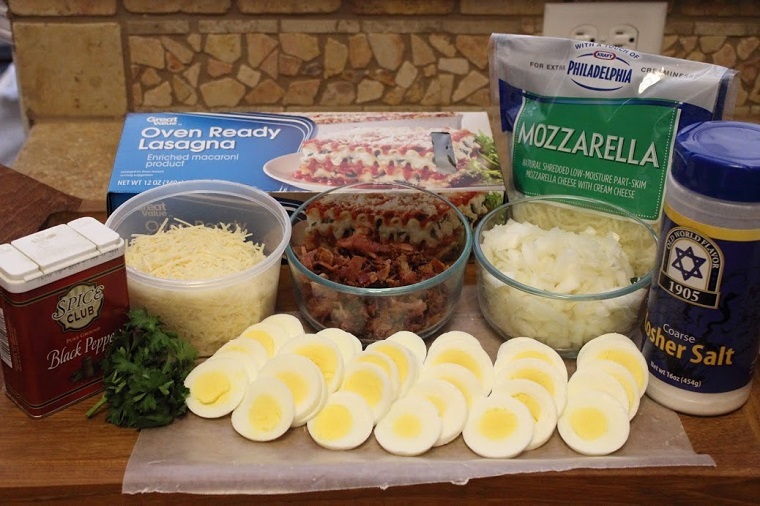 Eggs, cheese, bacon… Yum! I have to admit, this is the most unique lasagna recipe I have ever seen. I love breakfast, so I bet I would really enjoy this. I am drooling over this picture! 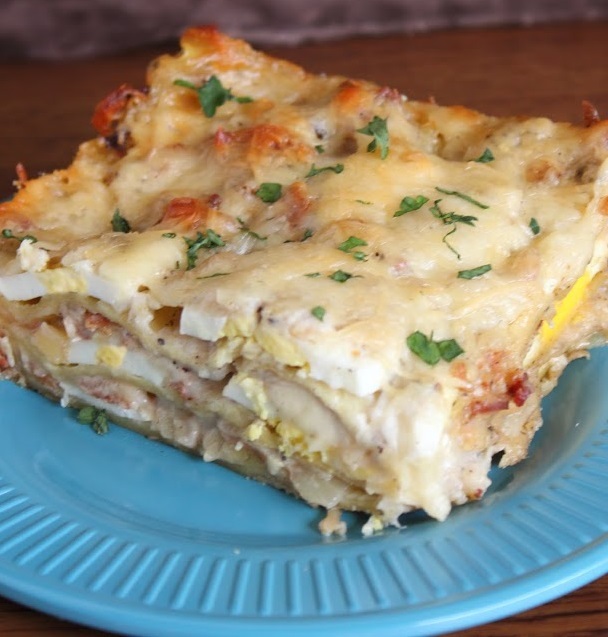 I never would have thought of breakfast lasagna and it looks delicious! That looks so amazing. We may have to have this this week. This is going on my list to make, with fruit cup on the side, a great brunch dish. Thanks for posting. I have never in my entire live heard of breakfast lasagna. I will definitely have to give this recipe a taste test! Oh my gosh, I would have never thought of breakfast lasagna. This looks crazy good and my kids would love it. Thanks for sharing you’re recipe. We’re so going to have to try it!! This looks amazing! My family would demolish this! A must try for sure! I’ve never thought about making a breakfast lasagna before! That looks like such an easy dish, and I bet my entire family would enjoy it! A great recipe for when I have overnight guest. Perfect to make ahead – serve with fresh fruit and breakfast is served! This looks so tasty! I will try it with GF pasta. this looks so yummy! I’m printing it off to make later! thanks! I’m in ahhh with your ingredients photo. I may have to make this when the grand kids come to visit – it would be perfect! That looks SO delicious! This would make breakfasts for our large family so much easier. 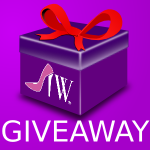 Will have to pin this to make very soon!! I’m saving this for when my daughter is home. She’ll LOVE IT. This looks so delicious. It looks like it would be a great meal to make ahead and warm up too. It would be great for an Easter Brunch too. I love lasagna, it never dawned on me to look for a breakfast version. This is super, and I would love to make it for a breakfast get together!! Can’t wait to try, the greatest meal of the day, BREAKFAST!!!! What a fun recipe, thank you for sharing. This looks great. It would be a great breakfast for Christmas Day!! Can’t wait to try it. Yum, this looks delicious. I would never have thought to make lasagna for breakfast. Thank you for sharing this recipe.